Is it me or are Anne Hathaway eyes' HUGE?!? Best Answer: she has scary buzzard eyes !!!! They're not THAT big. She has really pretty eyes, and she's a great actress. I never noticed her eyes to be abnormally large. She does have big beautiful eyes. Just you, she has the most precious eyes in showbiz! she has big, beautiful eyes, and she is a great actress, so who cares? Her eyes are big and pretty. yep, big lovely doe eyes! Kinda, but not in a bad way! Has anyone else noticed anne hathaway has BIG eyes.? 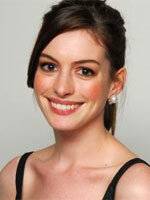 Can someone tell me why people find Anne Hathaway attractive? What is the big deal with Anne Hathaway? Can brown eyes attractive, even beautiful or stand out? Help! I have a HUGE date tonight! ?